This textbook is a refreshingly clear introduction to the core accounting topics that non-specialist students need to master. Designed to help students learn key principles, reinforce understanding, and apply accounting concepts to real business decisions, it is an ideal first stepping stone into the world of accounting. 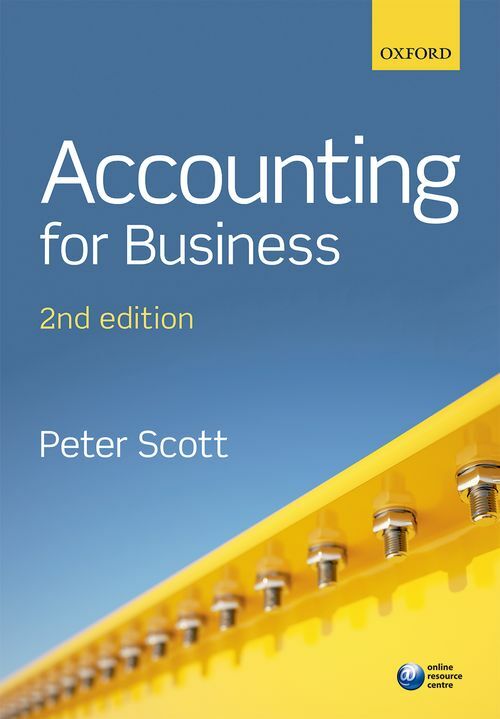 Peter Scott's Accounting for Business: * Offers full coverage of key accounting concepts in an authoritative manner whilst remaining sensitive to the needs of non-specialist students by using a straightforward writing style and crystal clear explanations; * Firmly sets accounting principles in context by using newspaper articles and online media to help students understand the relevance of accounting to a variety of business professions; * A range of Financial and Management Accounting examples recur throughout the book so students can strengthen their understanding of the material covered as the author regularly reviews and recaps information. Its unique online workbook includes the following features for students: * Interactive Multiple Choice Questions for revising key topics; * Numerical exercises to help you practise the calculation of accounting information from given sets of data; * 'Go back over this again' feature containing a mix of further examples, written exercises, true or false questions and annotated accounting information to help you revise and revisit concepts you may be unsure of; * Narrated video presentations provide practical demonstrations of how more complex accounting tasks are dealt with; * Web links directing you towards primary source material and articles from which you can learn more about the companies and organizations covered in the book. The second edition is also available with Dashboard, a brand new online learning and assessment tool. Dashboard provides lecturers with a complete solution to teaching accounting, featuring: * Quizzes. A test bank of over 500 ready-to-use questions, tailored specifically to Accounting for Business. Gives you the flexibility you need to manage, set and develop quizzes that are tailored perfectly to your course. - Gradebook. Automatically grades student responses to quizzes, while its visual heat maps provide at-a-glance information about student achievement and engagement. * Course content. Additional material to support your teaching, including PowerPoint slides and additional examples and solutions. * Communication. Share course news, spark a class discussion, or email your students with course information, all through the communication tab. Peter Scott is a Principal Lecturer in Accounting and Finance at De Montfort University, teaching at both undergraduate and postgraduate level. He An undergraduate personal tutor, he has been awarded a Vice Chancellor's Distinguished Teaching Award on four occasions following nominations by his students. Prior to De Montfort, Peter trained with Grant Thornton, Chartered Accountants, where he also gained post qualification experience, before moving into industry at Ashfield Holdings Plc. Peter has presented various academic papers on the subject of auditing at several conferences in the UK, and has jointly authored published papers in refereed journals. He has also undertaken writing assignments for the ACCA, CIMA and the CIES International University Network (University of Neuchatel, Switzerland).